Medial epicondylitis is pain over the bone on the inner side of the elbow. The piece of bone that can be felt on the inner side of the elbow is called the medial epicondyle. When the tendons attached to this bone are overstretched or torn, they can become painful. 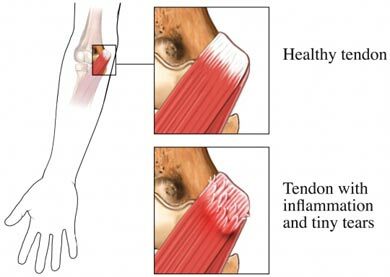 This is called tendinopathy . Medial epicondylitis is commonly called golfer's elbow, but it is not restricted to people who play golf. It can occur in tennis players and other people who repeatedly grip objects tightly. Golfer's elbow is caused by overusing the flexor muscles of the forearms. Overusing these muscles can stretch or tear the tendons attached to the medial epicondyle. An MRI scan is occasionally used for diagnosis, but there is only limited evidence supporting this use. Activities will need to be limited, including sports such as golf and tennis. A counter-force brace can be worn on the forearm if advised by a doctor. This brace limits the force generated by the forearm muscles when in use. Heat can be applied to the elbow when returning to physical activity and before stretching or getting ready to play sports. When the acute pain is gone, gentle stretching can be done as tolerated. Strengthening exercises for the flexor muscles of the forearm will be advised. Begin arm motions of the sport or activity as advised. Examples include golf swings, tennis strokes, or painting strokes. Golf injury prevention. Ortho Info—American Academy of Orthopaedic Surgeons website. Available at: http://orthoinfo.aaos.org/topic.cfm?topic=A00137. Updated August 2016. Accessed November 15, 2017. Józsa LG, Kannus P. Human tendons. Human Kinetics; 1997. Medial epicondylitis. EBSCO DynaMed Plus website. Available at: http://www.dynamed.com/topics/dmp~AN~T114235/Medial-epicondylitis . Updated July 15, 2016. Accessed November 15, 2017. Metz JP. Managing golf injuries: Technique and equipment changes that aid treatment. Phys Sportsmed. 1999;27(7):41-56. Petersen B, Rovati S. Diclofenac epolamine (Flector) patch: Evidence for topical activity. Clin Drug Investig. 2009;29(1):1-9. Shiri R, Viikari-Juntura E. Lateral and medial epicondylitis: Role of occupational factors. Best Pract Res Clin Rheumatol. 2011;25(1):43-57. 10/26/2010 DynaMed Plus Systematic Literature Surveillance http://www.dynamed.com/topics/dmp~AN~T114235/Medial-epicondylitis : Massey T, Derry S, et al. Topical NSAIDs for acute pain in adults. Cochrane Database Syst Rev. 2010;(6):CD007402.